Ian finally reveals all the characters from his Nugglife set, in the form of Dunnys, which I will see in about half an hour! Out the door to the Almighty Dunny show! 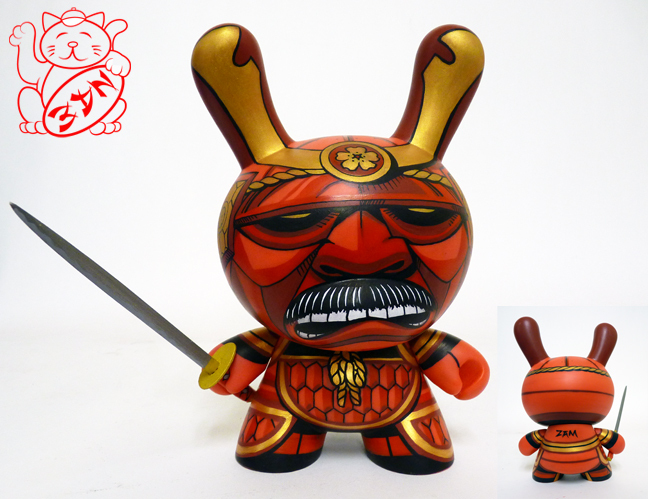 Zam kills it, yet again, with the 8-inch Zamuria Dunny custom. 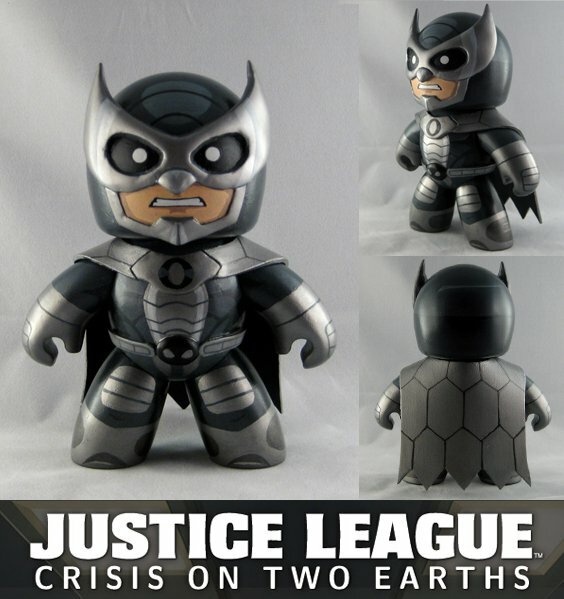 Can't wait to see these in person! I'm really digging several of these 2.5" Holiday Qees from Toy2R and the agnes b. company: my favorites are the silver one and the clear one in the middle, and that cool dusky tree silhouette qee on the right side in the image above. NICE work! This year give hope and love from agnes b., as Toy2R collaborates once again with the fashion company to bring six new 2.5" Holiday themed Qees to life. 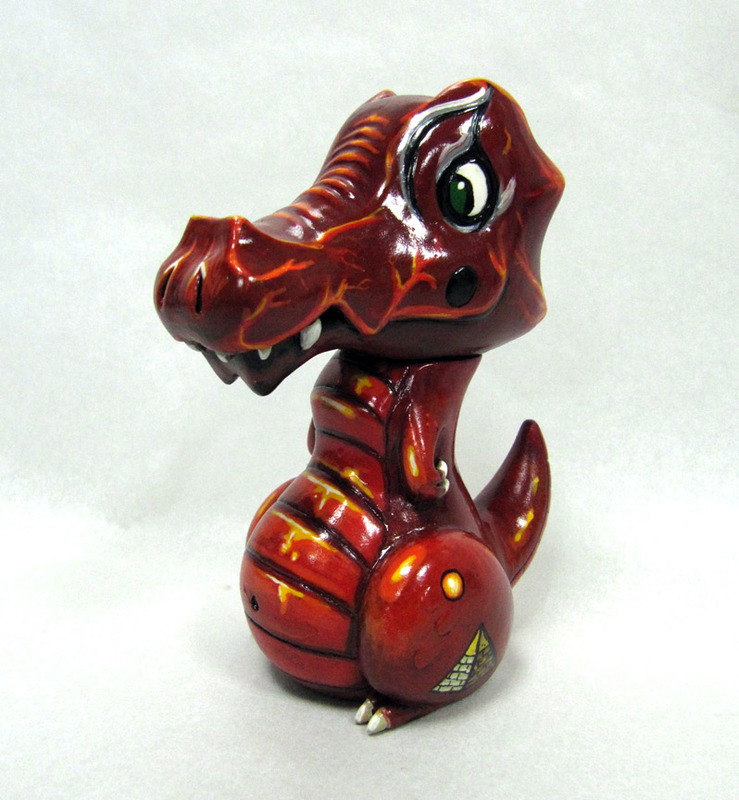 After a successful 2009 series, agnes b. approached Toy2R once again to develop stylish and unique set of Qee collectibles for their overseas Asian markets. Each 2.5" Qee includes keychain attachment and comes packaged in window boxes. The Qee collection is available exclusively through agnes b. locations in Hong Kong, Taiwan, Singapore, China and Macau. Give the gift of Qee and spread love and hope, courtesy of agnes b. and Toy2R. 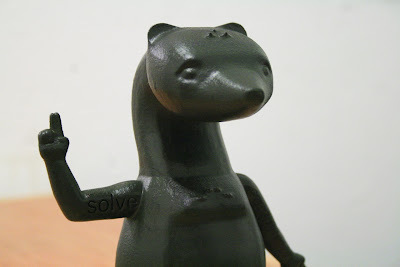 Foox is finally revealing the prototype for his upcoming Elemental Badgers series, scheduled to be released in 2011. 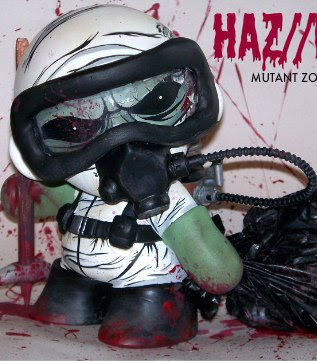 This series of 6-inch tall vinyl figures will be limited to 500 pieces in 5 colorways. The Elemental Badgers offer the world a view into the nexus between Science, Nature, and Magic. Each Elemental Badger will be handpainted, named, and numbered by artist. The Elemental Badgers play upon the 5 elements of Nature (Earth, Air, Fire, Water, and Soul), the elements of the periodic table (noble gases, flammables, liquids, metals, etc) and the different branches of the military (Air Force, Rangers, Marines, SEALS, etc) - making each individual badger a work of unique meticulously crafted art. In Japanese mythology, the badger was put in a sack and beaten to bring forth good luck. Each of these elemental totems carries with it a small ruin for exactly that purpose. So rather than beating the poor Elemental Badger for good luck, we transferred the luck to the ruin and on to you! 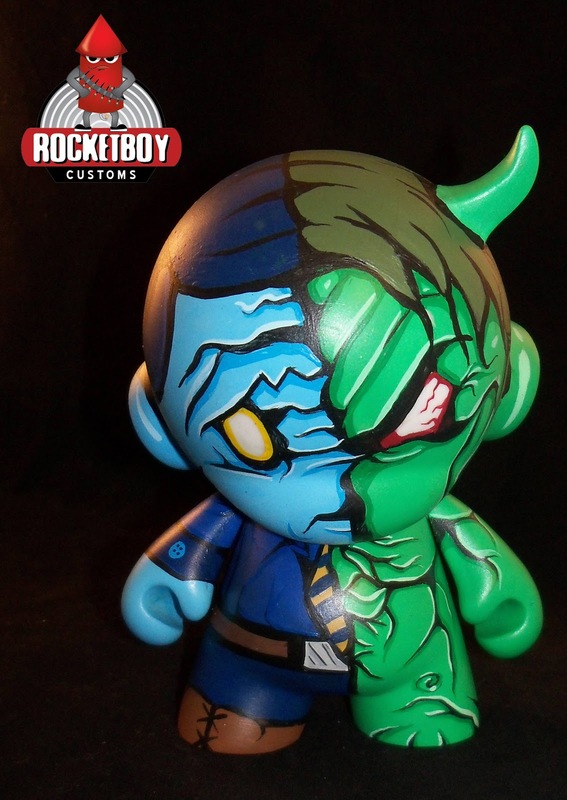 For an idea of what a Foox custom looks like, check out this album of images of the Foox-customized Nathan Hamill tyrannoCECILrex, and this image of a Foox-customized Bunnee Qee. 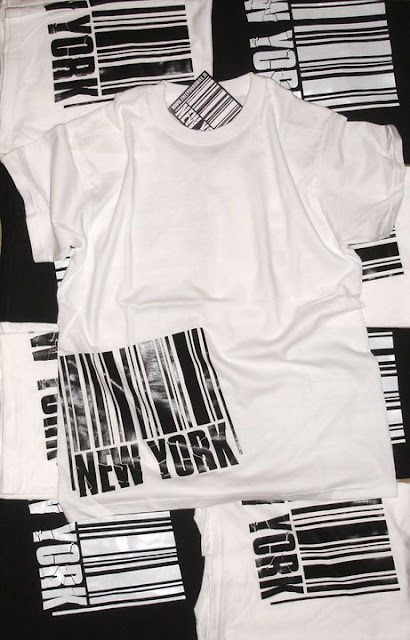 We now have in stock these excellent, soft NY Barcode t-shirts in Men's and Women's sizes, both black and white. The shirts are designed in Italy by Freeyoursmile and I believe we are the exclusive NY-area retailer stocking these shirts! Big thanks to our friend Willow for arranging this. 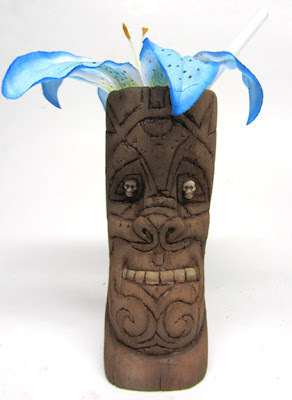 Dead Paradise is the latest original tiki carving by Mike "NEMO" Mendez. Part of our ongoing relationship with the New York area's premier tiki, totem and idol sculptor, "Dead Paradise" is a one-of-a-kind 5-inch tall piece, carved from balsa wood and brought to life by NEMO's capable hands. "Dead Paradise" is for sale here at Tenacious Toys. If you're into tikis and totems, bookmark our NEMO section so you can follow the newest releases! 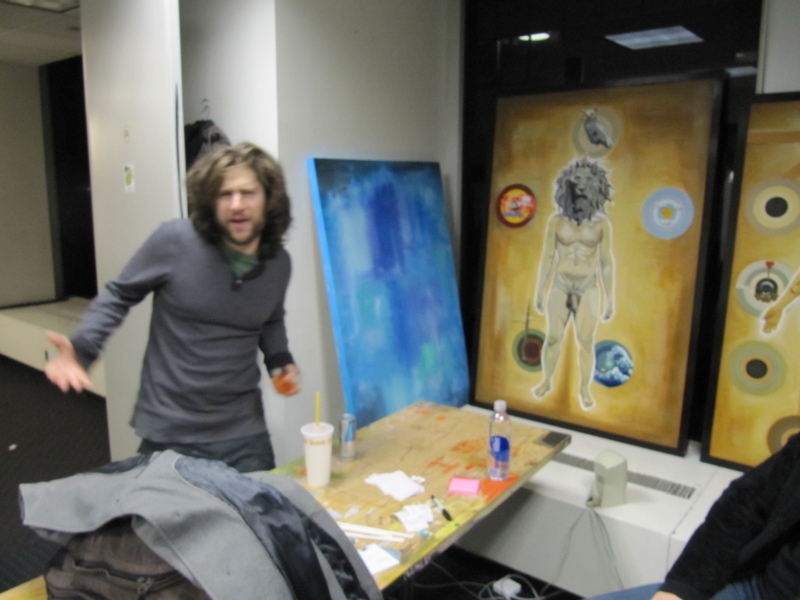 David Foox is a singular fellow: a child of the stars, living and working in NYC, an artist and a toy designer. He's at once mystical, spiritual, factual and gentlemanly. Roll it all together with furry mane of hair, and you have a genuinely compelling person. 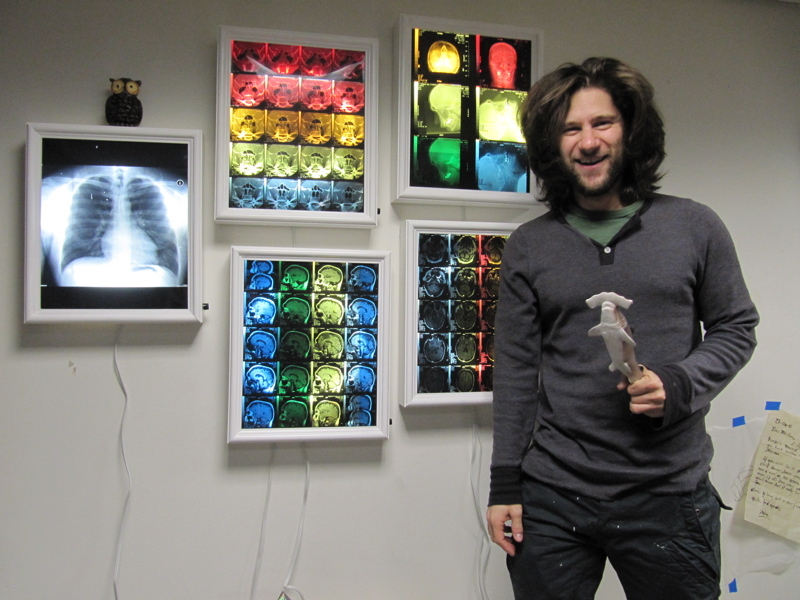 Fooxie recently invited us to come visit him at his studio- I needed to pick up some more of his Organ Donors mini figures for our shop, and some prints, and why not go for a tour of his studio as well? I had NO IDEA what I was getting us into. 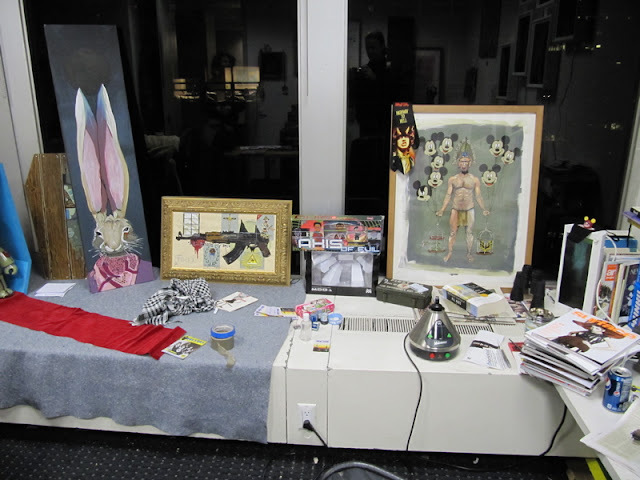 Foox's "studio," if you can call it that, is a 100,000 square-foot full floor in an office building in the Financial District of downtown NYC. The amount of space he has is mind-bending, and I am still dizzy from the nighttime views of the city from 20 floors up. Foox's actual painting studio occupies a window office at the corner of the building, overlooking the Staten Island Ferry Terminal. 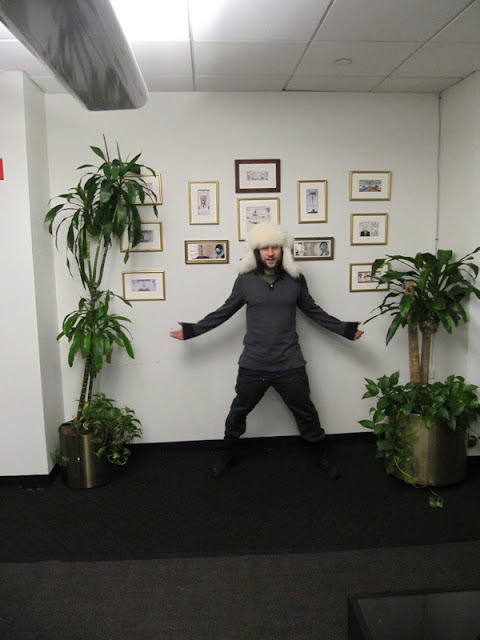 His receptionist has a desk outside his studio. There's a fantastic reception area, a room dedicated to Michael Jackson, a mini studio for platinum-selling artist Pizzi, funky masks, toys, prints and paintings everywhere. Apparently, somehow, he has the run of the entire floor. At some point it appears that Foox stopped trying to populate each room with his stuff: Foox-related items pop up in slowly spreading blobs, like ink seeping and creeping through the fibers of thick paper. But many window offices and cubicles remain empty. It would be impossible for him to fill up the floor. The juxtaposition of Foox's mystical artwork inside the framework of an empty corporate office space was jarring, to say the least. 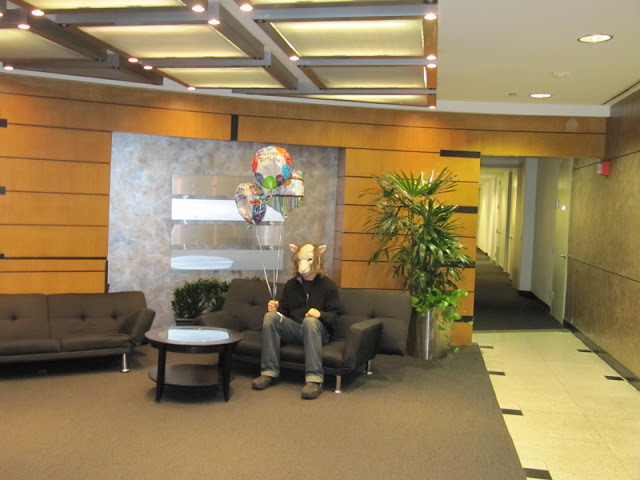 We all thought it would be best to take turns wearing a cheap lamb mask and carry around a bunch of half-deflated birthday balloons. We galloped and traipsed through endless corridors, rooms filled with empty cubicles and corporate reception areas, complete with potted plants. The above Foox-customized Toy2R BunneeQ is a part of a project Foox is working on- more installation art than simple custom toy, this project apparently entails giant Qees standing on red carpets, inside brightly-painted caskets. 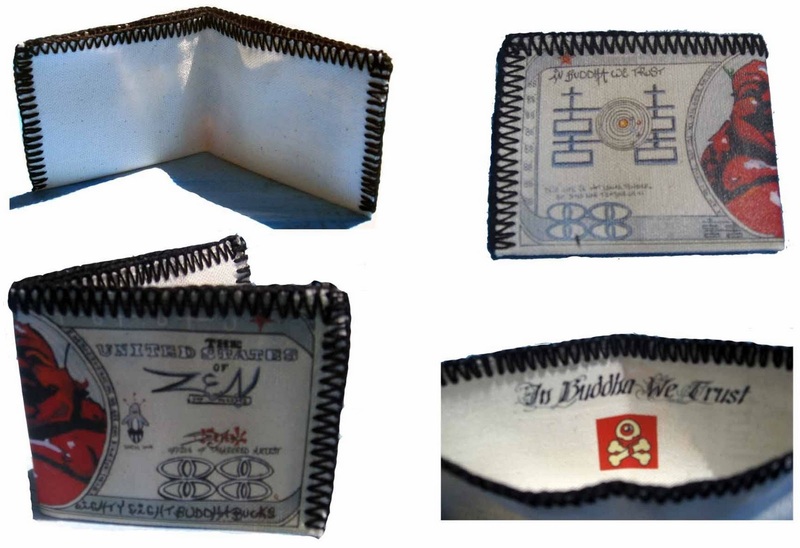 I was also able to get the skinny on Foox's "The Fifth Letter" print series, which is extensive, complex and laden with symbolism. 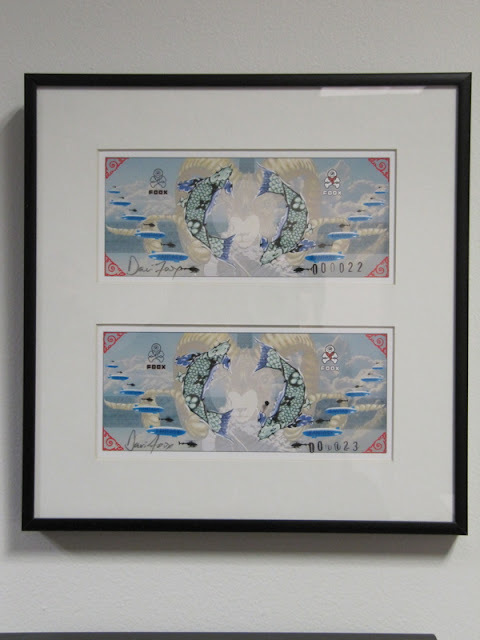 Each individually numbered giclee print is a sort of Foox currency- just over 6 inches long, each based upon a larger painting by Foox. Each successive print release is smaller in quantity than the one before. Foox has also taken note of the buyers of each numbered print in every series (see below), and he plans on releasing that info so that collectors can trade and seek out specific prints that they'd like to add to their collection. In this way the whole series becomes interactive between the collectors. 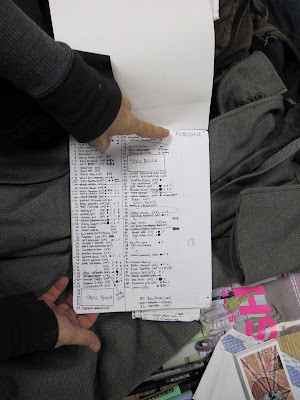 Foox shows us the list where he keeps track of the buyers of his Fortune prints. 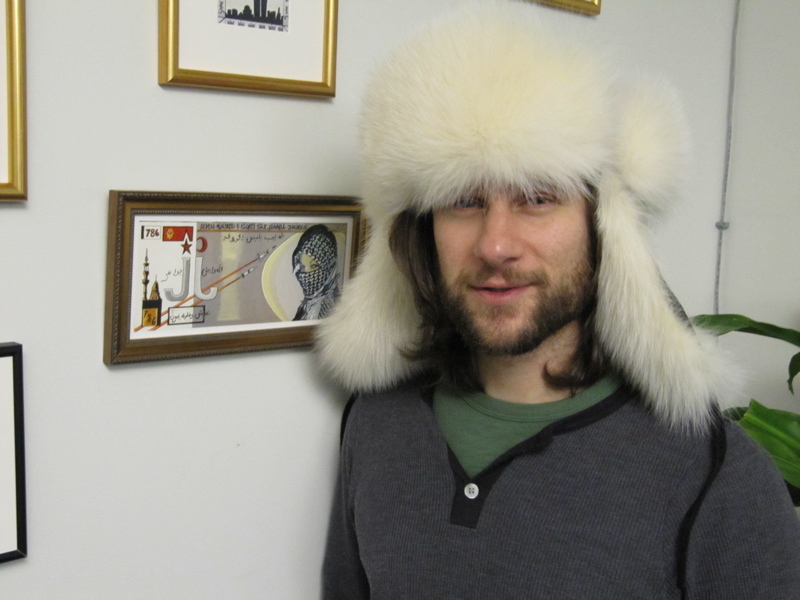 Foox with his collection of his own currency prints. Two of Foox's Fantasy prints. 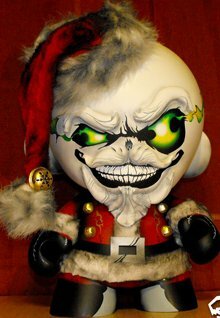 The Land of Misfit Toys show will come alive on Saturday, December 11, 2010 from 7 pm - Midnight at Royal Flesh Tattoo & Piercing located on 4005 North Broadway, Chicago. Royal Flesh Tattoo Gallery, Rotofugi and Graham Crackers Comics are collaborating for a unique custom toy show, which will showcase the creative talents of four (4) artists specializing in custom toy art: Fuller, B.A.L.D, Fried Gold Productions & Chicago’s own Rocketboy Customs. The gallery show will also include a live raffle with a combination of unique prizes from Royal Flesh Tattoo, Rotofugi and Graham Cracker Comics valued at approximately $400 or more. Raised funds from the raffle and other designated proceeds from the show will be donated to the American Cancer Society, the nationwide, community-based, voluntary health organization dedicated to eliminating cancer as a major health problem by preventing cancer, saving lives, and diminishing suffering from cancer, through research, education, advocacy, and service. This free show will feature unique art on display and for sale, ranging from custom urban vinyl toys to other kinds of DIY toys, including appearances from the custom toy artists Fuller and Rocketboy. Complimentary refreshments will be available with sounds from DJ Tommy Ruffingers. 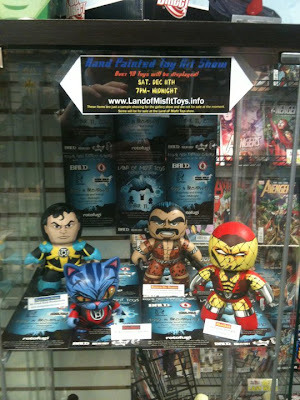 For more information on the Land of Misfit Toys show, call (773)975-9753 or visit their website. Is a locally owned and operated tattoo and piercing shop, established in July 2009, located on the corner of Irving Park and Broadway in Chicago. Royal Flesh is original on every level; their artwork, atmosphere and attitude. Royal Flesh’s mission is to provide their clients with services and modifications that are innovative, unique and custom, through specialized techniques to express their individuality, reclaim their body or beautify themselves. Royal Flesh prides themselves in providing a clean and comfortable environment, while also maintaining a wide variety of artists and styles. Rotofugi Designer Toy Store & Gallery, established in July 2004, is located on the border of Chicago's Lincoln Park and Lakeview neighborhoods. Since opening, Rotofugi has grown to become one of the world's premier sellers of designer toys from artists all over the world. Rotofugi features a diverse selection of vinyl figures, capsule toys, plush and more from both eastern and western designers. 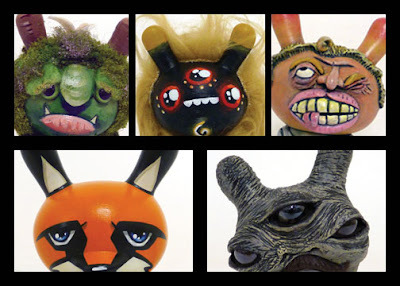 The adjoining Rotofugi Gallery features monthly art exhibits by a range of both local and nationally known artists. 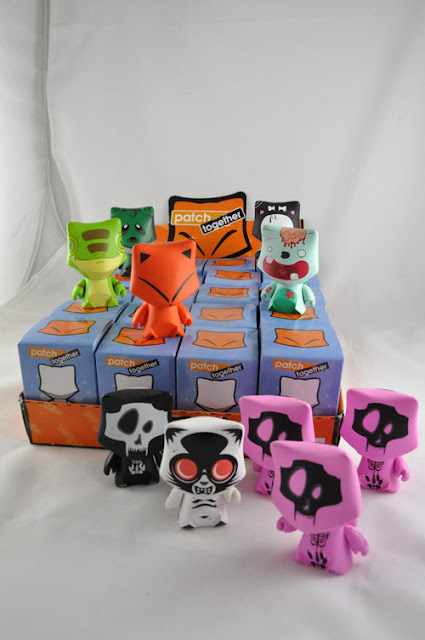 Rotofugi is owned and operated by husband and wife duo Kirby and Whitney Kerr. POLL: Help design the Laconic 1 figure! Lime Green, Cyan, Magenta or Orange/Red? We just got word of this impending colour choice this morning. No idea what the other side of the figure looks like! 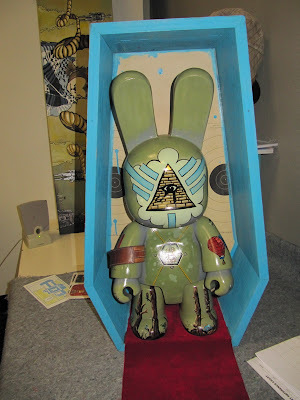 Just to whet your appetite: above we have a teaser with 5 pieces from the upcoming Almighty Dunny Show, kicking off Dec 11th at Halcyon in Brooklyn. Clockwise from upper left are: Lana Crooks, Chelsea Boxsom, Leathers 2000, Jay222 and Grimsheep. 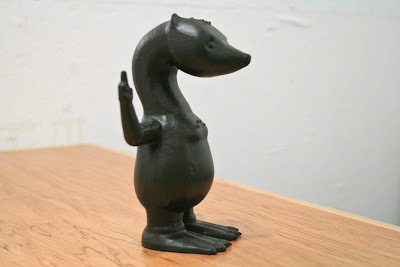 Tim Lockhart shares with us a sneak peek at the prototype of his Wazo figure, which NEMO sculpted. Can't wait to see the full reveal! 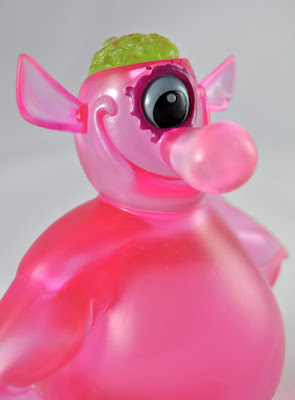 Think Pink Celle is a limited-edition 5.5-inch resin figure designed and produced by my man VISEone. The figure was produced for a German shop called Think Pink- it's a 3D representation of their store mascot. Think Pink has the exclusive on the green colorway below, which has a limited edition of 15 hand-signed and numbered pieces. They will be selling for 49 euros on December 6th. VISEone will be selling the two different pink versions (opaque and translucent) on his own site on December 6th to coincide with the release of Think Pink's green colorway. And on Dec 11th VISEone will be selling the 3 as-yet-unsold Comic Stripped versions (above) for 120 euros on his own site. VISEone has also been working in vinyl: the new PatchTogether Floxy the Fox vinyl mini figures will be for sale December 6th at PatchTogether, and at selected retailers. Wholesale inquiries can be directed here. 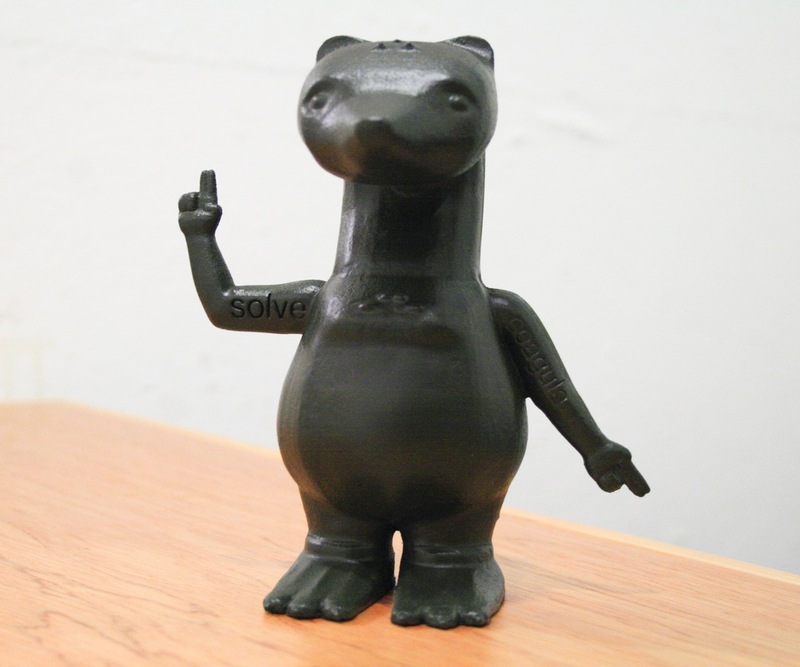 VISEone has his own exclusive colorway of Floxy: pink with a black skeleton, which accompanies the NYCC black & white colorway. VISEone's pink exclusive colorway is limited to 40 pieces and comes signed by VISEone, and you can buy it here for $9.99 each.